Looking to serve a high quality fruit spread to complement your restaurant, hotel, or event's upscale atmosphere? 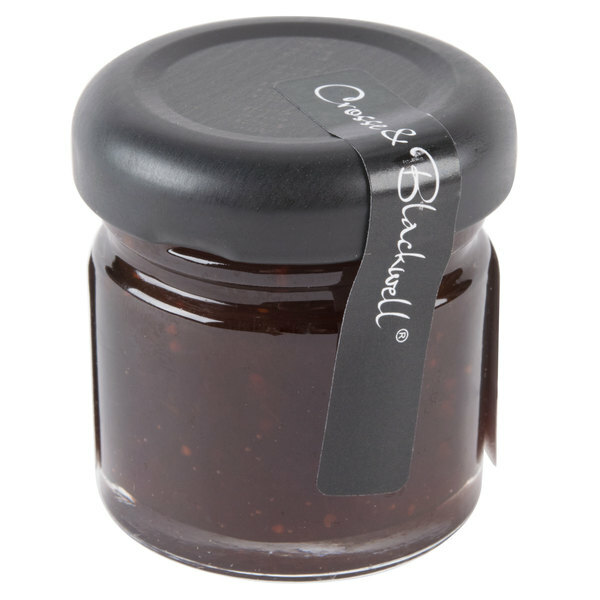 Since 1706, Crosse and Blackwell have been crafting one-of-a-kind, savory flavors tied to the culinary traditions of Great Britain. Today, their refined palate includes unique products with the finest ingredients and robust flavors, including this strawberry balsamic flavored fruit spread! Made with fresh strawberries, sugar, and a splash of balsamic vinegar, this fruit spread bursts with tangy, full-bodied flavor that's not too sweet. The distinguished flavor profile is sure to set your fruit spread apart from standard strawberry jams and jellies. Each 1 oz. glass jar has a high-end appearance, which is sure to make a statement for your upscale bed and breakfast or superior room service. 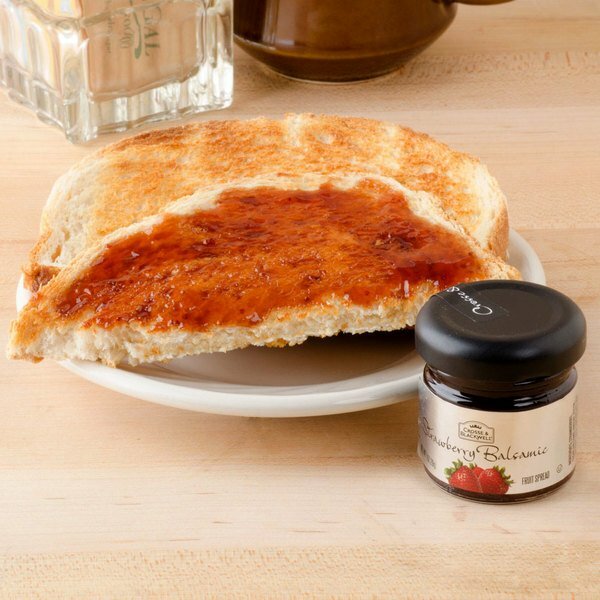 Also great for high end hotel or restaurant use, these perfectly portioned, single-serve jars allow your patrons to spread just the right amount of strawberry balsamic flavor they prefer on their toast or other breakfast offerings. Convenient for your guests and easily disposable, each jar carries a sense of sophistication that's sure to charm your guests. Rather than serving portion cups, upgrade your dining experience and serve strawberry balsamic fruit spread in attractive, mini glass jars! 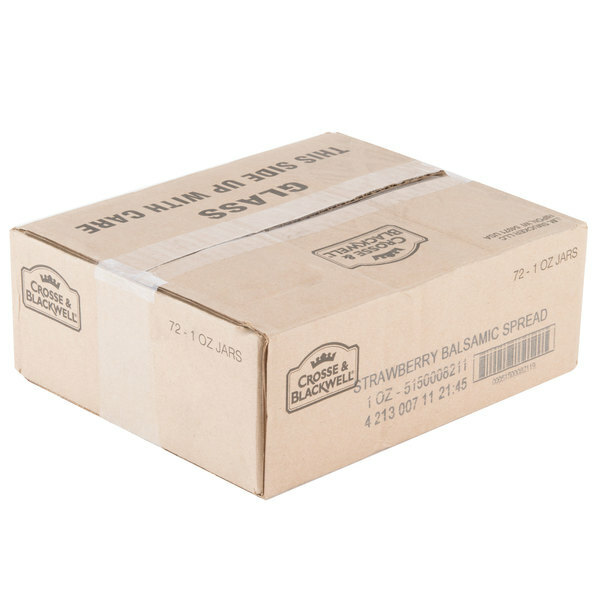 A great tasting strawberry balsamic fruit spread that is delicious and great balance of sweet and tangy. Great on our toast and really a nice variation of fruit spread. A very unique flavored jam that has a tangy flavor with the added balsamic. The spread is great to serve with our cheese and cracker trays. 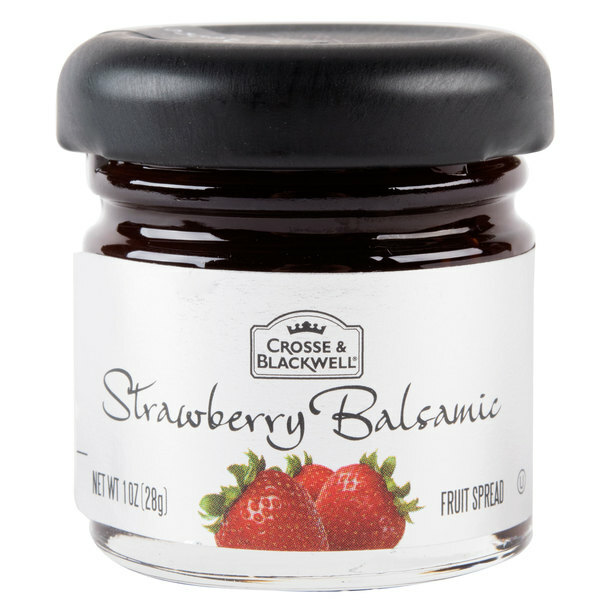 The Crosse & Blackwell strawberry balsamic fruit spread is a true appetizer style spread. A great way to top a cream cheese spread and the complexity of flavors is super. I love the hint of balsamic and the sweetness of the strawberry. Winner! I have never had or even heard of a jelly or jam that had Vinaigrette in it and I couldn't help but imagine how bad it must taste. But, I was informed by some customers of mine that this was the best tasting fruit spread that they have ever had. So, I have to say how bad I assumed. This is one amazing tasting fruit spread! A nice artisan style fruit spread with the great taste of strawberry with a tangy hint of balsamic. A true delight on bagels in the morning.